On January 24 we invited all participants and partners of MegafoniX for a massive jam session. Through this participatory musical project, driven by the district development contract Jonction, we connected residents from the Brussels neighbourhood Les Marolles with professional artists. At this jam event, we shared some highlights of MegafoniX and presented our other participatory projects . It was a festive start of the new year: pocket concerts of Stemagnifique and Remork & Karkaba, followed by rampant jams with a raft of amateur musicians. MetX artists Vital Schraenen, Luc Mishalle and Laurent Blondiau hosted the session, which also included Ghalia Benali, Michel Massot and other musicians. The past two years, over a hundred residents and local actors from Les Marolles teamed up with artists from MetX via MegafoniX. 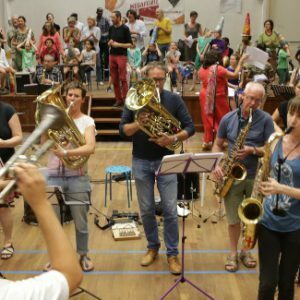 The result, a unique ensemble for instruments and voices, aims to reflect the cultural diversity of Brussels.